A great way to stimulate imagination and creativity. Wikki Stix are coated with a patent wax finish that means they stick to each other and to most surfaces - but not to your fingers! 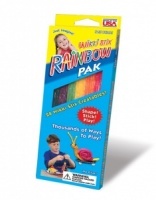 Great for making letters and words or for creating drawings and diagrams, Wikki Stix are a tactile resource that all young children (and many not so young) will enjoy. In his book "Dyslexia, the Gift", Ron Davis shows how making tactile letters (he used clay) helped him overcome his severe dyslexia and learn how to spell. For children struggling with literacy, Wikki Stix engage the same kinaesthetic learning paths, but with a lot less mess! No glue - no mess - just wipe with a dry cloth to clean. Wikki Stix do not crumble or dry out. PRIMARY SET: Contains 48 sticks in Six Primary Colours. NEON SET: Contains 48 sticks in six Neon Colours. A little anicdote... Having sold a set at a fair, I noticed the little boy making a pair of glasses while mum and dad had a coffee. He proudly wore them around for the rest of the afternoon!! 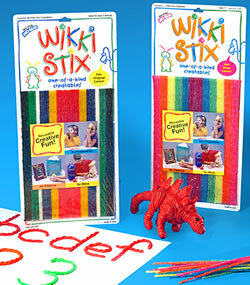 This pack is great as an introduction to the wonderful world of Wikki Stix.